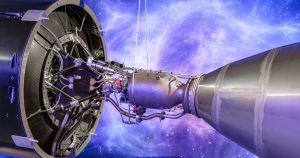 UK space startup Orbex just showed off its Prime Rocket’s gigantic second stage — the “world’s largest 3D printed rocket engine,” according to a press release. The entire rocket, including the engine, will stand at 56 feet (17 meters) tall — roughly a quarter of the size of SpaceX’s Falcon 9 rocket, for context. In other words, things are heating up in the world of 3D printed spacecraft. The post UK Startup Shows Off World’s Largest 3D Printed Rocket Engine appeared first on Futurism.